I came across this image on Pinterest the other day. It has been circulating all over the online sharing circles. I would love to give credit to its creator but I can’t seem to locate them. If you know where this originated, please let me know. The sentiment… could this be any more spot on? It is hard to come by. But when you stumble upon it you are blown away. And most often the road there was not an easy one. You certainly did not comes across it on the proverbial couch. Sometimes it involves hard work. Other times it is merely serendipitous. (Yeh, I hate that word too, but it worked here). 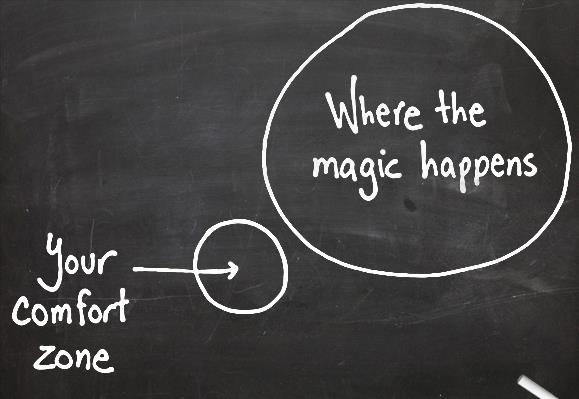 But almost every time you find yourself smack in the middle of the magic circle, you have traveled outside your comfort zone to get there. You can see here, sometimes it is not all that far away… but that step outside the zone is a scary one. And it is always worth it. Go ahead…do it. You won’t be disappointed. And here’s hoping that you will find the magic. wonderful…i loved your post. but i’m pretty sure it’s thursday…..no?